One of the loudest claims the communists used to make was that the unity of proletarian internationalism would render obsolete any national or ethnic prejudice. It was supposed that the brotherhood of workers would consign all ethnic strife to the proverbial "dustbin of history". Bulgaria under communist rule provided a stark example of the resilience of bigotry under Marxism. In 1984, the Bulgarian government under Todor Zhivkov began a bizarre and brutal campaign to forcibly assimilate Bulgaria's Turks, who comprised about 10% of the population. During a period of two months, the entire Turkish population was forced to take on Bulgarian names. Villages were cordoned off and people were assigned new names. Often, brothers from the same family found that they now had different last names. The Turkish Weekly describes the brutality and chaos of this period as follows. "The Bulgarian totalitarian state started an assimilation act towards the Turkish minority at the end of 1984 and the beginning of 1985. More than 1 million Turks were renamed by force within two months. The Bulgarian totalitarian state literally started a war against these undefended and poor people. The totalitarian regime mobilized all of its force: army, police troops, special soldiers, armed volunteers, even an organization of children. The authorities of the totalitarian state began persecuting the Turkish population in all of the regions [under its control]. Many people were detained in the police station for days and beaten to death. During this act of the totalitarian state, 517 people were arrested and sent to the concentration camp on Belene Island, and nearly 400 people were exiled or imprisoned by fake courts. Before being sent to the concentration camp, exiled or imprisoned we were subjected to unbearable cruelties and brutalities. We were made to live in conditions which can't be described. Our families were persecuted and put under psychological pressure again and again. In 1989 the Bulgarian totalitarian state launched [a campaign of] ethnic cleansing. 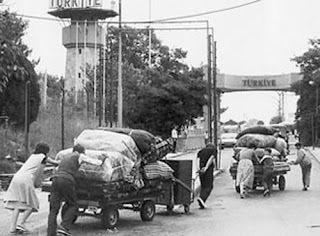 Within 72 days 350,000 Turks were deported from the country." In addition to those who were forcibly deported, there were those who found the pressure of living hated and hunted in Bulgaria to be unbearable. To the lasting credit, the Turkish republic opened its borders and its heart to its Turkish brothers in Bulgaria. It offered them the right of return and the opportunity to take Turkish citizenship. For thousands of Turks who had literally had their very names stolen, the kindness of the Turkish government and people was priceless. Many sold their property at great loss to save their lives. In Turkey, many were bewildered by a capitalist system that was alien to them as well as a form of spoken Turkish quite different from what they knew in Bulgaria. Many people know of ethnic Germans driven from their homes at the end of World War Two. Many remember the images of streams of ethnic Germans trudging hundreds of miles on foot to an uncertain future in a new country that was in a state of physical and economic ruin. Today these Germans have been absorbed into German society. Their grandchildren preserve the memory of the injustice done to their grandparents, but do so from established and comfortable homes and not refugee camps. Bulgaria's Turks were as forlorn and desperate in the 80s as the Germans were in the 40s. The idea of jus sanguinis, the right to citizenship by virtue of ancestry was critical to minimising loss of life. As noble as the idea is of a nation of laws such as we enjoy in the US, states such as Germany, Turkey and Greece as well as Israel with their legal principal of jus sanguinis occupy a critical and essential place in the family of nations. Turkey has had dark chapters in its history. Kurds and Armenians as well as Assyrians are all too well acquainted with this fact. It badly needs to develop legal and constitutional safeguards for its own national minorities. But it deserves respect and recognition for its humanitarian assistance to its Turkish compatriots in Bulgaria. How does a nation preserve its language, its culture and its way of life and at the same time accommodate its national minorities? Turkey has taught the world valuable lessons, both in the failures of its history and in its successes. It is a nation to be studied by a world that sees new crises unfolding every day . In the post communist era, the situation of Bulgaria's Turks has improved. With difficulty, names taken away have been returned, if not the property that was lost. The history of Bulgaria's Turks stands as stark testimony to the moral bankruptcy of communism and the fragility of human decency. I wish Bulgaria's Turks peace and tranquility, wherever they may choose to live.